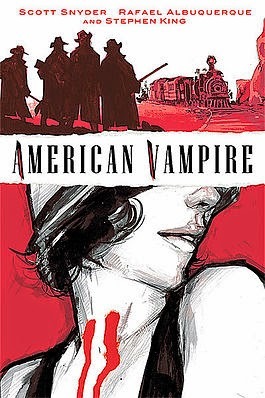 It’s the story of a new strain of vampire starting in the wild west era of America, but spans multiple decades. The story is told mainly through the lives of Skinner Sweet and Pearl Jones. Skinner is an anti-hero who operates strongly in the grey area of life. He is also the the first of the American Vampire strain. Pearl Jones is a fledgling actress who becomes Skinner’s first “child”. As the story moves on there are many side characters to draw upon. Like the Vassals of the Morning Stars, which is a secret group of vampire hunters determined to wipe out every strain of vampire. If it goes the movie route I feel that James Mangold could be a great choice. He handled the Western genre really well with 3:10 to Yuma. Which also proved he knows how to get the performances he needs out of his actors. And his work on Identity and Cop Land showed he can handle the darker side of the characters and the world they inhabit. Not to mention he did Wolverine last year which was at least two-thirds of a good movie before the final act fell apart. Skinner Sweet- The main character for the story, Skinner is a outlaw in the wild west, who gets bitten and becomes the first of the American Vampire strain. Even though I will get some flack for this choice, I feel Josh Holloway would be a great choice for this role. when he is properly directed he can really deliver a strong performance. Even though the show wasn’t always great I really felt that Holloway was always compelling as the troubled grifter Sawyer. And he also delivered for his small part in Mission Impossible: Ghost Protocol. Pearl Jones- Pearl is a struggling actress who works many jobs in the 1920’s when she is introduced into the book. But she becomes a strong female counterbalance to Skinner. Pearl also ends up being the much more interesting character as the story moves through the decades. I could see Michelle Monaghan could be as a good choice, and I feel she is in the proper age range. She is young enough to do multiple movies and she is old enough to play the twenty something Pearl. Monaghan has a true acting talent when she is given the proper part. Heck she even made Eagle Eye bearable in spite of Shia Lebouf. Henry Preston- The human husband of the vampire Pearl, he isn’t a huge part, but he is crucial to the character of Pearl. I lean towards Robert Kazinsky. He doesn’t have a lot of exposure, but I feel he would take on this role well. And it would be easy to age him up as the decades pass. He carries a lot of charisma, and even if most of the roles I have seen him in he plays a hard case, he shows the potential to be a strong support to the main characters. James Book- The sheriff who tracks Skinner in his outlaw days he needs to be believed as a human who can handle a vampire. I would cast Daniel Day Lewis, he brings a strong acting presence, as well as bringing legitimacy to the movie. Plus I feel that he could play the many aspects of the character James Book. From the formidable Sheriff who tracks Skinner. To the husband and father who wants nothing more than to protect his family from the threat of vampires. Felicia Book- The daughter of James Book she has sworn vengeance on Skinner Sweet for the death of her father. She will later be an agent of the Vassals of the Morning Stars, so she needs to be a strong female who can portray the hurt that she carries with her for most of her part of the story. I would cast someone like Emily Van Camp. She doesn’t have a lot of acting experience, but her portrayal of Sharon/ Agent 13 in Captain America: The Winter Soldier showed she has a lot of talent. That is why I would like to see her take on the role of Felicia. Hattie Hargrove- Hattie is the roommate of Pearl in the 20’s. She is jealous of Pearl and everything she has. Hattie also gets turned, but she becomes the opposite of Pearl in that she becomes way more feral. I would like to see Kate Mara. She is a talented young actress who plays the jealous crazy type well. Need proof watch the first season of American Horror Story. And what I have seen of House of Cards she can hold her own even when sharing the screen with the likes of Kevin Spacey. This is just how I would cast the movie/TV series if I were allowed to choose. Thank you for reading this and I encourage any comments you may have on my choices or if I missed any important characters.